Agriculture is the cultivation of animals, plants, fungi and other life forms for food, fiber, and other products used to sustain life. Agriculture was the key implement in the rise of sedentary human civilization, whereby farming of domesticated species created food surpluses that nurtured the development of civilization. The study of agriculture is known as agricultural science. The history of agriculture dates back thousands of years, and its development has been driven and defined by greatly different climates, cultures, and technologies. However, all farming generally relies on techniques to expand and maintain the lands suitable for raising domesticated species. For plants, this usually requires some form of irrigation, although there are methods of dryland farming; pastoral herding on rangeland is still the most common means of raising livestock. 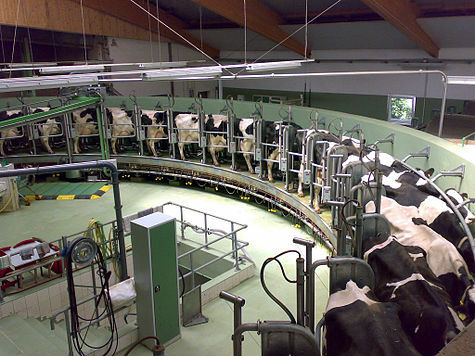 In the developed world, industrial agriculture based on large-scale monoculture has become the dominant system of modern farming, although there is growing support for sustainable agriculture. The major agricultural products can be broadly grouped into foods, fibers, fuels, and raw materials. Agriculture is a major industry in the United States of America and the country is a net exporter of food. As of the last census of agriculture in 2007, there were 2.2 million farms, covering an area of 922 million acres (3,730,000 km2), an average of 418 acres (1.69 km2) per farm. Agriculture in the United States is primarily governed by periodically renewed U.S. farm bills. Governance is both a federal and a local responsibility with the United States Department of Agriculture being the federal department responsible. Government aid includes research into crop types and regional suitability as well as many kinds of subsidies, some price supports and loan programs. American farmers are not subject to production quotas and some laws are different for farms compared to other workplaces. A large part of the American farm workforce is made up of migrant and seasonal workers, many of them recent immigrants from Latin America or aliens working under work permits. Additional laws apply to these workers and their housing which is often provided by the farmer. 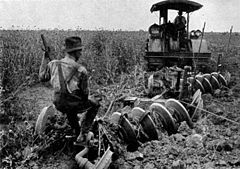 Corn, turkeys, tomatoes, potatoes, peanuts, and sunflower seeds constitute some of the major holdovers from the agricultural endowment of the Americas. European agricultural practices greatly affected the New England landscape, leaving behind many physical foot prints. Colonists brought livestock over from Europe which caused many changes to the land. Grazing animals required a lot of land and food to sustain them and due to grazing, native grasses were destroyed and European species began to replace them. New species of weeds were introduced and began to thrive as they were capable of withstanding the grazing of animals, whereas native species could not. In 2004, of the 145 million employed workers in the US, 834,000 of them held jobs as agricultural workers. 83% of these jobs were as farm workers. The median hourly income as of May 2004[update] was $7.70 for farmworkers planting, growing and harvesting crops, and $8.31 for farmworkers tending to animals. Sustainable agriculture in the United States was addressed by the 1990 farm bill. More recently, as consumer and retail demand for sustainable products has risen, organizations such as Food Alliance and Protected Harvest have started to provide measurement standards and certification programs for what constitutes a sustainably grown crop. ^ Organic and non-GMO Report. New certification programs aim to encourage sustainable farming. ...there are roughly 200,000 varieties of animal pollinators in the wild, most of which are insects? This page was last modified on 25 February 2016, at 15:53.